In a big pan/wok(which would fit the cooked rice-cos you’d have to mix them in this), heat a Tbsp of oil,2 cloves, a cinnamon stick, a cardamom and a bay leaf, a tsp of mustard seeds, wait for them to crackle, add curry leaves, green chillies, cashews and let them brown. Time to add onions, salt and let them brown. Then add grated ginger, garlic and spinach and let them cook for a couple of mintutes. Drain the semi-cooked cauliflower and add it in, throw in some frozen green peas, add a tbsp of channa masala, a tsp of kitchen king masala, 1/2 tsp of chili powder, more salt, fry for a minute or so, add 1/2 cup of water , cover the wok and let the masala cook. More water if needed if you feel the masala is unboiled. Once it is done and if you have a watery consistency, on high flame, keep the wok open and let the water evaporate. Add the cooked rice in, more salt and toss until the masala coats well on the rice. That’s it.. Serve with any curry of your choice. This is the fastest dinner I have ever made. I bought a couple of green plantains after reading a traditional Fijian curry recipe, one of my student’s mum’s signature dish. The combo of spices looked very much South Indian 🙂 So gave it a try. 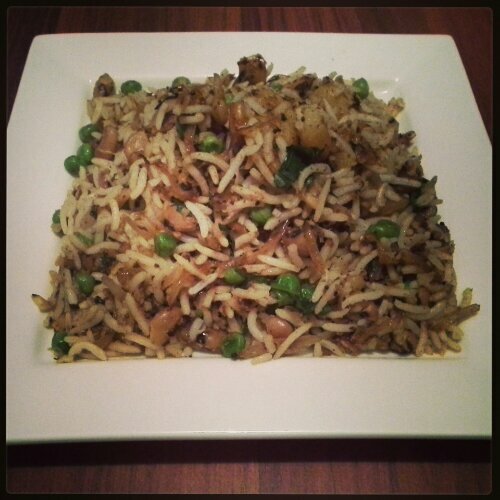 Also included is the recipe for a peas pulav which can be made in a rice cooker. Yeah, you read it right, you don’t need the chunky pressure cooker to make this. And it is 2000 times better than what you get in Indian restaurants. Also blend some coconut to a fine paste. This is the easiest rice you could do. 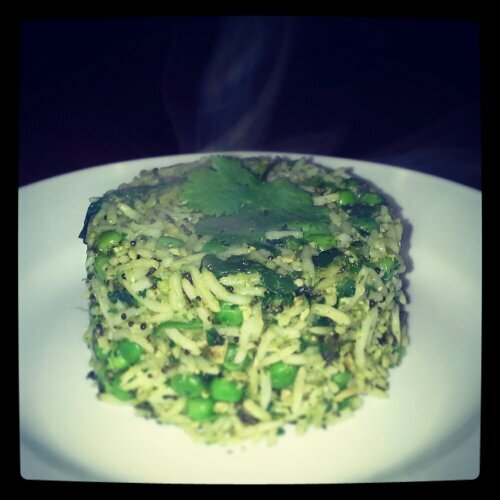 Do you fancy the Indian peas pulav? No complex spices/No Masalas/No ginger/garlic. Yep Simple and a great accompaniment for any curries-Indian/not. 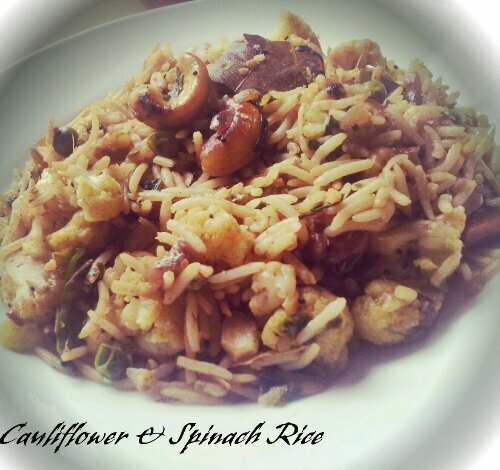 For the rice(1.5 cup), you need to heat up 2 tsp of oil in a pan, add 2 cloves, cinnamon, 1 cardamom, a bay leaf and 2 green chillies slit and 3/4 of onion (very finely chopped), fry until transparent, add salt, frozen green peas(1/2 cup), few mint leaves( yep, this is important), more salt fry for a couple of minutes and add in rice, yeah uncooked rice and fry in oil for a couple of mins and transfer all the contents to a rice cooker. [Usually for a cup of rice, you add 2 cups of water :)] For this rice-1.5 cups, you add 2.5 cups water and 1 cup of light coconut milk. Add more salt, turn on the rice cooker and your end product will look like the picture below. And remember-NO long grained rice-Basmati is what you need 🙂 Oops, missed out cashews. Add them before onions for extra texture to your rice. In a pan, add oil, mustard seeds, once it pops, add asafoetida, spinach leaves, green peas, once oil coats on them, add the blended coriander and salt in and wait until it gets bit dry and add rice in and mix them well. 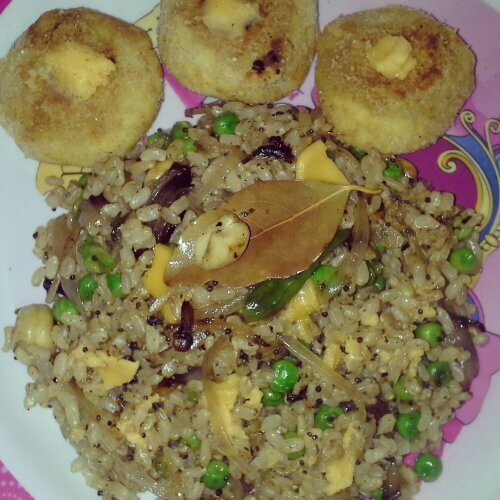 In a pan, add oil, mustard seeds, let it pop and add shallots, garlic, fry until transparent, add turmeric, potato, spice mix, mix well, fry for a couple of minutes, add the cooked black-eyed beans, green peas, salt, coriander and chives and salt and mix them all well until the raw smell of the spice disappears. 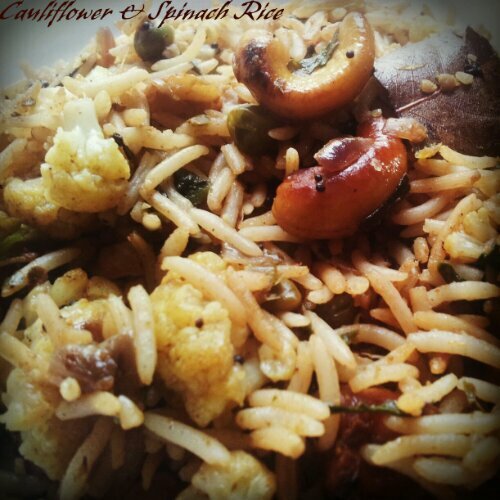 In a pan, add 2 tsp oil, add clove, cinnamon, cardamom and bay leaf and mustard seeds. Once they pop, add shallots, cashews, green chilli in and toss until shallots turn translucent. 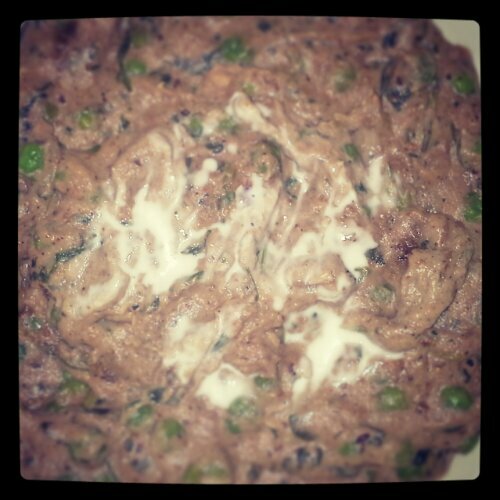 Toss in the green peas, salt and add coconut milk until peas are cooked and add the rice in. Add extra salt. Mix them all well and serve with cheese bits on top. Fenugreek leaves are very bitter-but they are awesome in cleansing the body. I try to incorporate them into the food. It is always on my Indian shopping list. For this recipe, all you do is go to an Indian grocery and ask for fresh ‘methi’ leaves. (In Sydney, we have Wigram street in Harris park-which has more than 15 shops selling these leaves). 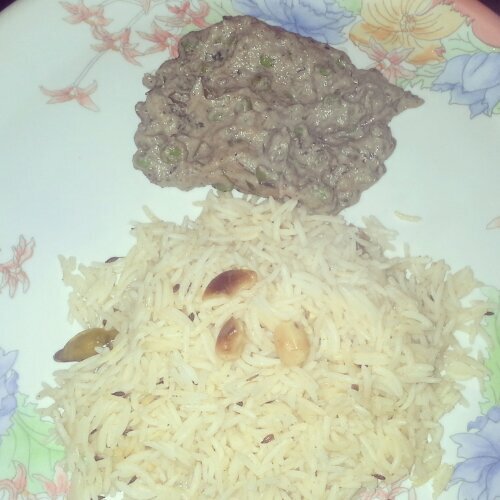 Methi – Fenugreek leaves, Matar-Green peas, Malaai-Cream. 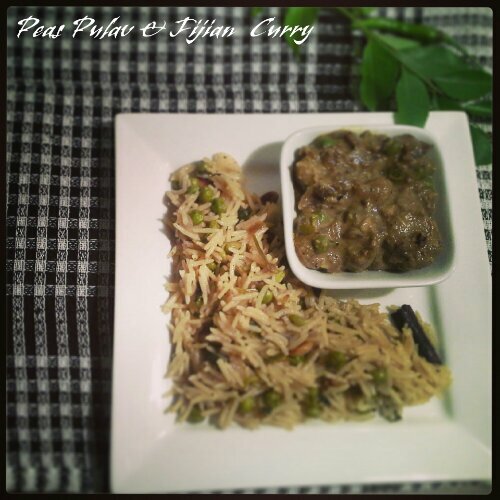 If you are craving for a creamy curry, this is for you. It goes excellent with any flat bread/cumin rice. Wash methi leaves-add salt-leave 10 mins-squeeeze extra water out. In a pan, add tsp of oil, add the methi leaves-fry until they are cooked. Keep them separate. In a rice cooker, add rice and water. 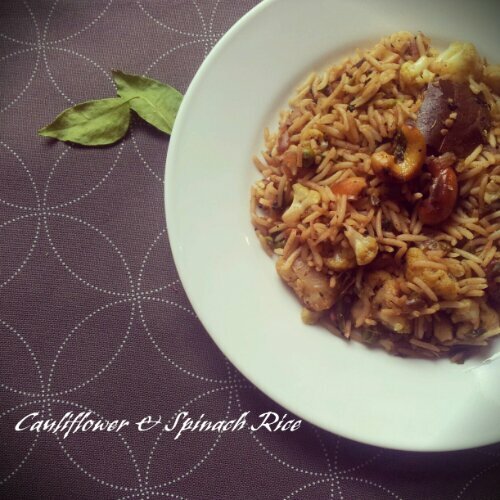 In a pan, add oil, when it is hot, add cumin seeds, green chili, cashews, once cashews are brown, add the cumin powder, fry for a minute and pour over the rice, add salt and turn the rice cooker on.